No-one has put up with more from me, I mean, spent as much time listening to me listening to her than Kiersty. And so the only reason I can give you to buy this book is your trust in me. If you trust me, buy Kiersty’s book. It is full of amazing poems and font play. If you are so strange that you don’t enjoy it, I will buy your copy from you and keep it for myself because I am going to need at least twenty or a hundred copies. First editions, worth a fortune in ten, twenty years, he smirks wickedly rubbing his hands together and wondering if he could out Shylock Ben Kingsley whose Shylock was pretty good. 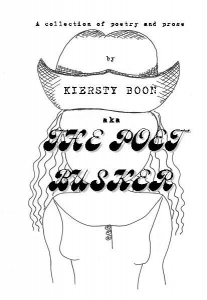 Why are you still here reading me playing prose games, check out Kiersty’s book, you know it’s the smart thing to do and it only costs a tenner. OH thank you, you. I know that this kind of post is a comment killer but it’s lovely to hear you liked my book so much. Does that mean I have to buy you a double whisky now? I hope you love the book Simonne. If you want to send your address my way, I’ll post you one of the free poem postcards too. I challenge anyone not to buy after reading your words. Going to buy this & yours at months end. On your recommendation I am going to buy it. You have excellent taste! Yours is one of my favorite sites. Charming? Yes. Persuasive? Yes. Inspiring? Yes. Just plain – no – not plain anything – fancy, fancy, and fanciful; bejewelled, filled/embellir with passimentarie. (Poor use of French – but I mean embellished and highly decorated language…) I come here and often leave with gooseflesh. How much is a tener in American? A book has been duly purchased – better be good Squires! I’m sure it will be. oh it’s chalk cliffs of Sussex – chalk-walk indeed. “The most eagerly unanticipated event ever! Cam at the Dan poets was nice enough to give me a chance to do a set at the Dan O’Connell Saturday poetry sessions, first Saturday in November. I’ve decided to invite everybody in the universe (yes, that includes you, God). But wait! There’s less! Because I’m going to throw in poems about transcription! Poems about blogs! Poems about typing! There might even, if you’re very lucky, be poems about filing cabinets! Chances are YOU, person reading this, will be mentioned too, or at least a line in a poem will contain a strong implication relating to a friend of a budgerigar that your mother’s brother’s uncle’s workmate’s boss’s cat once saw, when they were very little.